Summer in North Carolina can be brutal. You definitely don’t want to be without your air conditioner on the hottest day of the year. But without a routine maintenance plan and tune-up for your cooling system, you could come home to a hot house and no easy way to fix it. A routine maintenance plan, like one with Weather Master, means that your system is regularly cleaned and maintained, catching small issues before they become big (costly) problems. 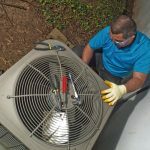 A maintenance plan can save you money in lower utility costs because your technician is regularly keeping your air conditioning system working at peak efficiency year in and year out. With a well-maintained system you can expect fewer breakdowns, which will save you money with fewer unnecessary repairs. You will also add years to your system, which will also save you money. Keeping your system regularly maintained will also help with keeping warranties valid—have you checked your warranty lately to see if you’re compliant? If you haven’t had regular maintenance, chances are you might not be. What does a Tune-Up or Maintenance Plan entail? The outdoor unit is checked and cleaned—condition of the wiring and coils, unit is clean, unit is level and free of obstruction. The ductwork is checked for cleanliness and that all ducts are sealed and insulated properly. The motor and parts are all working efficiently. And that’s just a sampling of what a Weather Master Maintenance Plan entails. For more information, you can see a comprehensive list. Of course, like everything Weather Master does, we offer our 100 percent satisfaction guarantee—if your system breaks down after your tune-up, we’ll refund you the cost of the tune-up and work to bring comfort to your home.